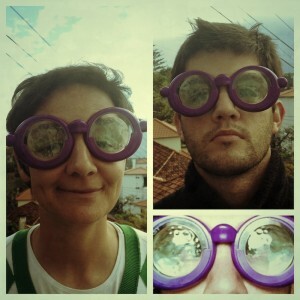 Hugo and Catarina, from Wind Birds, as experienced birdwatchers, have been researching and thinking a lot on a new design of optical equipment to substitute binoculars and more recently they have submitted a patent for these birdwatching goggles! These goggles allow one to clearly observe birds or other wildlife while having your hands free to hold a recording device for your reports, a phone, a camera, a bottle of water or any other useful item. The birdwatching goggles are much better than the conventional binoculars as they are much lighter, hands free and so, less susceptible to shaking. The way the glass is designed by looking at different angles you achieve different magnifications. Over the last two years we have done several trials with our customers. During these period NDAs have been enforced. We expected to present to the public our new birdwatching goggles in several birdwatching fairs. With a magnification than can go from 5 to 20 times and 170 degrees field of view, these brand new goggles allow brighter and sharper images than any of the Swarovski, Leica or Zeiss binoculars.